Your website has been up for months, and your traffic has held pretty steady. You don’t want to complain about a thriving business, but you’re just not seeing the patients that are the best fit for your practice. But is there a way to keep your schedule full and still bring in the kind of patients that are ideally suited to your clinic? While many medical practitioners are happy that their marketing is bringing patients in the door, a good marketing campaign should not only deliver clients, but bring in the clients you want. The best way to reach the ideal patients for your medical practice is by breaking down their interaction with your clinic into simple steps, leading them easily and naturally to make contact with you. Since not everyone who visits your website will come to your practice, you should tailor your marketing to appeal only to the patients you want to work with. Don’t worry about the patients who aren’t a good fit for your practice; letting them know that you only treat certain conditions will allow them to seek other avenues and save you both time. 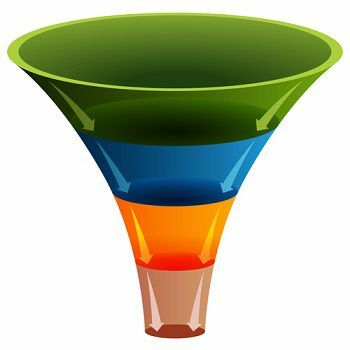 Imagine your marketing process as a funnel: all of the visitors to your website are poured into the top, and only your ideal clients come out of the smaller end. The wide end of the funnel appeals to everyone. As they begin to travel through the funnel, your marketing message becomes more and more streamlined, filtering out each of the non-relevant visitors. Finally, you are left with only the visitors who found many elements of your message useful, and are therefore the best potential leads for your practice. Landing pages. Your landing pages should clearly delineate each facet of your practice. For example, if you are a podiatrist who does not want any more athlete’s foot cases, eliminate the suggestion that you will take them on. Instead of saying outright that you will not take these clients’ cases (which can negatively impact a reader), ensure that your practice area pages comprehensively address the conditions you do treat. Keywords that have a clear focus are rewarded by search engines, allowing your ideal patients to find you more easily. Blogs and articles. Fresh content is key to attracting and retaining clients, and can help at every stage of the client conversion process. A blog post giving your take on a recent news story can be used at the top of the funnel (attracting as many new users as possible), in the middle (explaining how your medical services could have changed the outcome), or near the end (guiding interested readers to other relevant links). Offers. A client may spend hours reading your free content, but it will take a push to make him consider paying for your services. Newsletters, free books and guides, and other offers that appeal specifically to the patients you want are a low-risk reward for people who are interested in your services. Okay, My Ideal Patients Are on My Site. How Do I Make a Compelling Offer? As the promising leads pour out of the end of the funnel, you will need to make sure you have a way to catch them. Don’t forget the call to action! Each of your content pieces should close with a suggestion on how to continue the journey through the funnel or take the leap to contact your practice. If you have a free offer ready to send prospective clients, make sure you ask for a valid email address so you can follow up regularly with your leads. If you don’t have a free guide to offer your prospective patients, call 866-460-3724 to have the content gurus at Foster Web Marketing work with you to get your downloadable book up and running ASAP!